The father of a man shot by police said a vigil held for his son was "a reminder we need answers and justice". 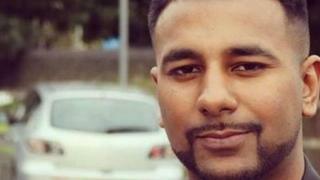 Yassar Yaqub, 28, from Huddersfield, was a passenger in a car when he was shot on a slip road near junction 24 of the M62 on 2 January 2017. About 50 people attended a vigil at the spot where he was killed in a police operation. Mohammed Yaqub, Yassar's father, said the family was "still fighting for justice day in, day out". "It's a reminder... that we need answers," he said. The police operation is being investigated by the Independent Police Complaints Commission (IPCC). The watchdog said it could not publish its findings until criminal proceedings were complete. Image caption Mohammed Yaqub said he had to limit the number of people attending the vigil for "safety reasons"
A minute's silence was held during the vigil and balloons were released. Mr Yaqub said: "There was going to be a lot of people going to attend but I've had to restrict [numbers] because of safety reasons... most of the people here are very close family and friends." The watchdog said it was reviewing CCTV footage of Mr Yaqub's movements in the hours before his death. It previously said none of the police officers involved had been wearing cameras, and no relevant CCTV footage of the incident had been found. The IPCC confirmed a non-police issue firearm found in the car had undergone ballistics and forensic testing. Data from mobile phones had also been analysed, and accounts from officers and witnesses collated and reviewed. Moshin Amin, from Dewsbury - the driver of the Audi in which Mr Yaqub was shot - is accused of firearms offences and due to stand trial in April. He denies possession of a firearm with intent to cause of fear of violence, possession of a sound moderator and possession of ammunition.